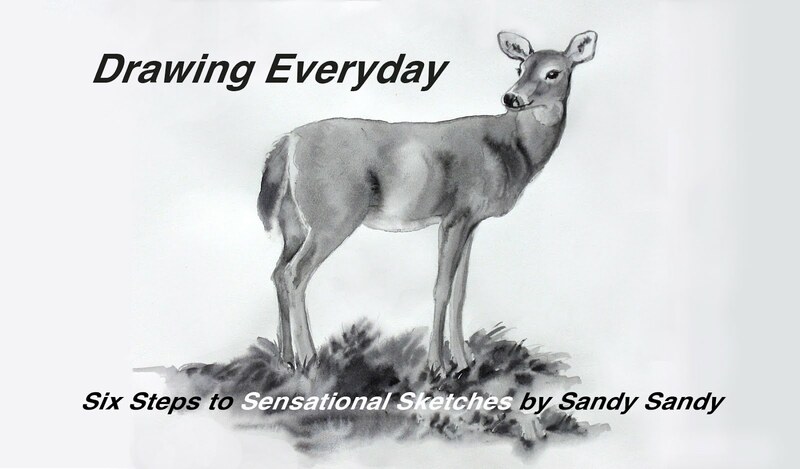 Today Susan Bronsak,from West Virgina, sent in the first submission for or current drawing challenge. 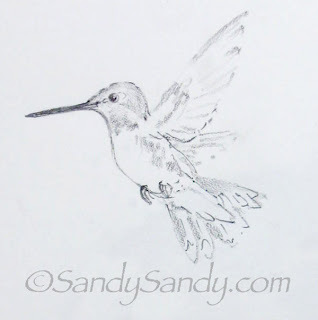 She writes, "I’m wondering if you might consider doing a wing demo maybe in graphite and in watercolor? I personally struggle with those wings making them convincing in my own eyes. This is her sketch using an HB Derwent water soluble graphite sketching pencil. She used the side of the pencil through most of this and then the point just to emphasize details as I’ve shared in my demos. She also adds, "I truly find this a wonderful technique so as not to get too detailed too soon. (Easier to erase if need be, because it doesn’t scar the paper :) This was fun and thank you for the reference photo." Once again, thanks so much for your wonderful drawing and input Susan!! I too often struggle with the hummingbird's wings in flight. In the reference photo I posted yesterday, I used a flash to freeze the wings in motion, however in real life, they are just a blur and almost invisible. With the wings, in drawing and painting, I've found that less is more. 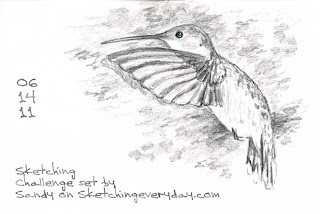 See how I have merely indicated the wings here in today's sketch. 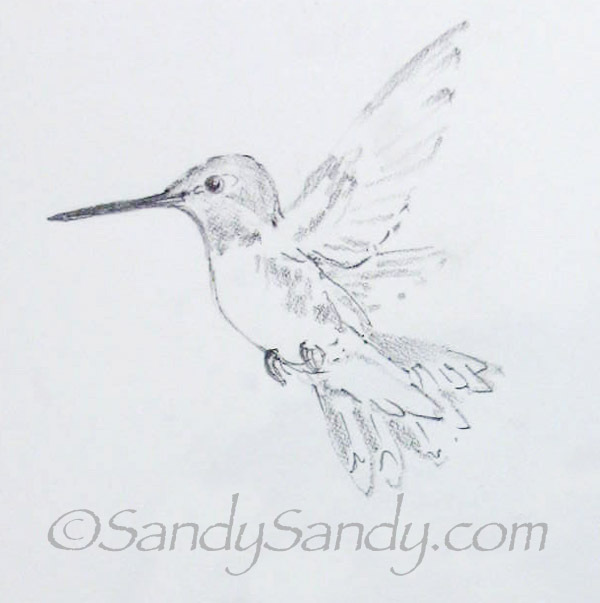 I redid the painting of the hummer in flight from yesterday and you can see it posted today on my web log. I'm still not 100% satisfied, but I am getting closer. As per Susan's request, I will see what I can do about putting together some kind of demo on this subject in the next day or two. 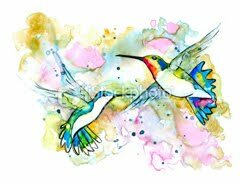 What I love about your hummingbirds is the fact the wings look delicate and yet powerful and one can truly feel movement. I feel mine are stiff or frozen. 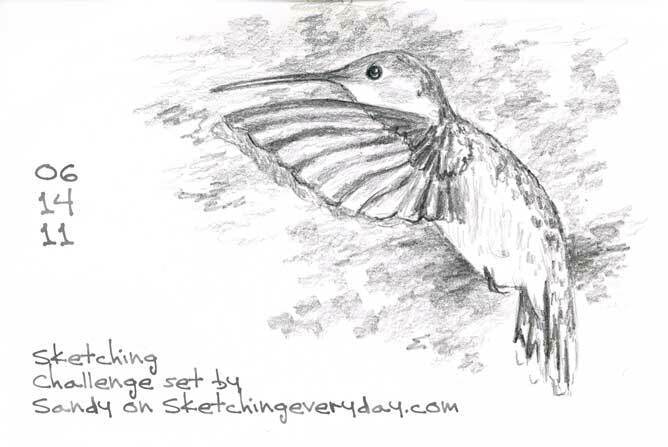 I love how you rendered the wings in this sketch! And Bless your heart.......thank you for considering the demo on wings. I'll have to remember the "less is more" on the wings. I felt like they were way too heavy in my sketch. A big thank you for sharing your photos for the weekly theme. I've not gotten close enough shots of hummers to be able to see all that detail. Keep inspiring all of us!